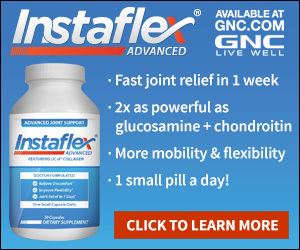 Instaflex is a joint relief supplement that can be found in thousands of stores, including GNC, Vitamin Shoppe, Vitamin World, and Rite Aid, across 18 countries worldwide. Instaflex can be reached directly at 800-436-0920. It is a revolutionary joint health formula which has been scientifically developed to relieve joint discomfort and support overall joint health, and is made from all natural ingredients. Instaflex is also an official sponsor of the Arthritis Foundation.